Earlier this year, we went on holiday to the south of France and I had particularly envisioned photographing spring flowers on this trip. The plant I was most interested in finding was the wild tulip. Most of us know tulips very well because they grow in gardens and appear in flower shops in a plethora of colors and flower shapes (examples were shown in earlier posts here and here), but there are several wild forms, some of which occur in Europe (even in Switzerland). However, I had never seen a wild tulip and on our trip we did not discover a lot of wildflowers except fir one particular afternoon. 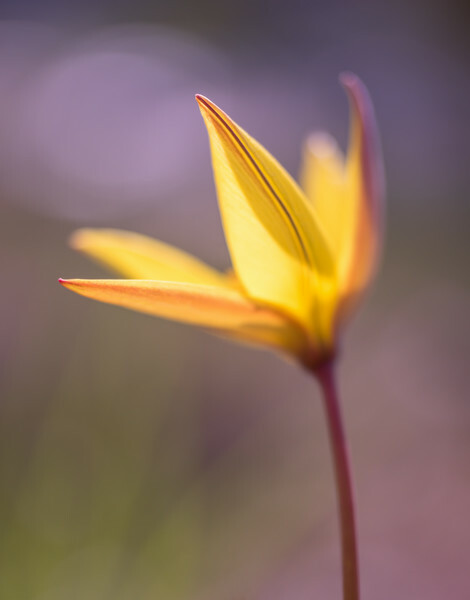 We had hiked all day long through the Gorges du Verdon, on the Sentier Martel, and had almost made it back to the parking lot at Pointe Sublime, when I stumbled upon the beautiful yellow wild tulip shown here; its scientific name is Tulipa sylvestris ssp. australis. 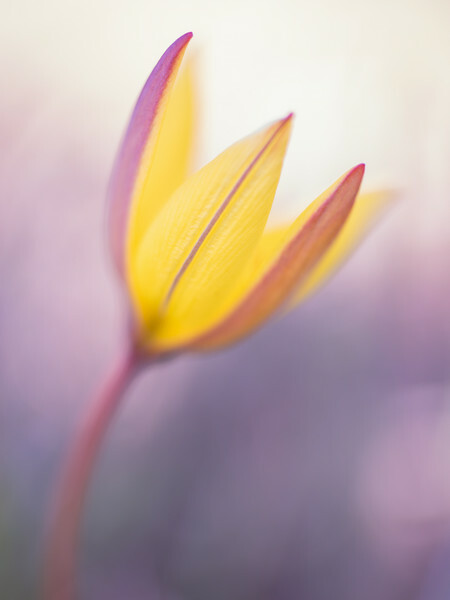 The petals of Tulipa sylvestris ssp. australis have a reddish line. In the photograph above, the "classical" structure of a flower belonging to the lily family (Liliaceae; the group of plants the tulip belongs to) is easily recognized. It consists of three sepals (the outer ring of yellow "leaves") and three petals (the inner ring of yellow "leaves"), which look almost identical in most tulips. However, in the two photographs below you can see that the sepals and petals in this wild tulip differ in their color. Moving further towards the center of a typical lily flower follow six stamen, which are again arranged in an outer and an inner group of three. Finally, the stigma in the center is typically tripartite. 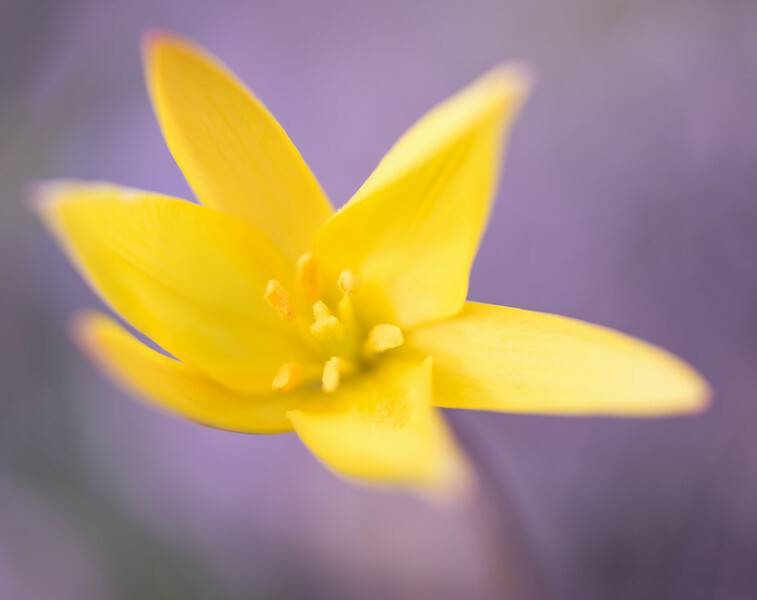 This flower structure and also the overall shape of wild tulip plants closely resembles their cultivated descendents, but the wild relatives look like miniature versions of the bred cultivars. At least the specimen that we have encountered was much smaller, inconspicuous, and rather difficult to spot. Tulipa sylvestris ssp. australis, the particular subspecies of tulip that we encountered and that is shown here, is one of over 70 species of wild tulips. Their natural range extends from Spain and Portugal all the way to China, while the largest number of different species are found in Central Asia. Tulipa sylvestris ssp. australis is characterized by the reddish color on its sepals and petals, which can easily be distinguished in the photograph above. The outside of the sepals is covered by a reddish color, while the petals only have a thin red line.